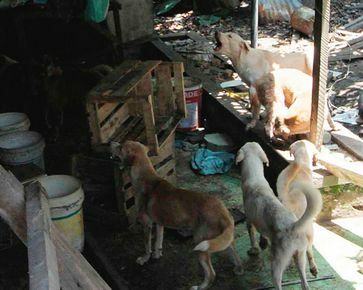 A man from Indonesia left his 9 dogs unfed for 2 weeks during a vacation; and when he returned home his starving dogs attacked and ate him. The bond between man and dogs is something that needs no explanation. There are many real life stories which depict how pure the bond is. But here’s an incident about dogs which is completely opposite to the ones you’ve heard. Andre Lumboga, a man from Indonesia, went on a holiday for the Eid al Fitr leaving his 9 dogs unfed for two weeks. As Andre returned, his dogs were already starving and seemed completely happy; not because he had returned, but for the reason that they got something to eat. Andre was attacked by 7 dogs, the dogs that had no food or water for two weeks, and also ate two of the weaker dogs. Andre’s body was discovered after a neighborhood guard noticed luggage outside the man’s house, even days after he had returned home. The guard approached the house and noticed an awful smell. When police arrived they discovered Lumboga’s mutilated body inside. When the police entered the house, the hungry dogs tried to attack them and therefore, the police had to paralyze the dogs. Moreover, the Vancouver Sun reports that Andre Lumboga was from Sulawesi island, a place where dog is commonly eaten. Somehow, Andre was himself at fault; if he had not left the dogs unfed, it is possible that this scenario might not have taken place. Previous articleA man who was blind and deaf was struck by lightning, and after that, he could hear and see again. Next articleDiscovered in 1976, the Megamouth shark is an extremely rare species. Only 54 of them have ever been seen.